Starting a vineyard is no small task, but is one that can reap big rewards. With careful planning and execution, you can ensure that your vineyard will provide abundant crops for many years. There are many factors to consider when choosing the perfect place for your vineyard. Climate – Take a close look at the high/low temperatures and frost-free periods for your area. Factors such as wind and altitude are also important to note. These factors help in determining where your vineyard will prosper. Sunlight – Grapes require sun to grow well. Find an area that is away from trees and other shade-producing plants. Soils – The quality of the soil in the area is another key factor. Consider the fertility, types of soils, drainage and the depth of the soil. Water – This includes both the quality as well as water sources. How much water is available from wells, etc. in the area and what irrigation options are available? Field Size – How large will your vineyard be? Determine this early on when you decide which grapes you plan to grow and how much room they will require. Wineries – Ultimately, you’ll want to produce wine from your grapes. If you are not completing this yourself, how close is the nearest winery? 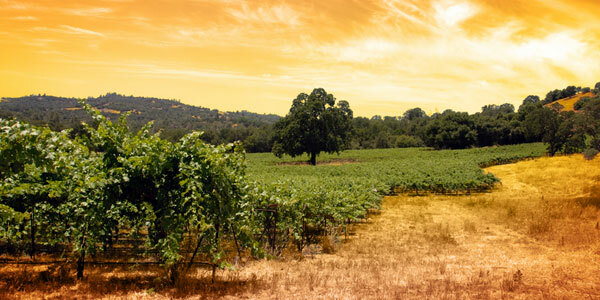 Other factors – Agricultural zoning and regulations, sources of power and cost of the land are other considerations that need to be thought out when choosing a place to start your vineyard. Research which type will grow best in your location and/or visit local vineyards to see what types of grapes grow well in your area. Remove the top layer of dirt, including all weeds and roots, and discard. Till the soil thoroughly to provide loose, workable ground for planting. Begin by marking the rows by making 3-4 inch grooves through the loosened soil. Next, place stakes where each grapevine will be planted. Space plants 6-8 feet apart. Dig a hole that is twice the size of the pot that your vines are planted in and slightly deeper. Mix potting soil with the original soil and place a small amount of the mixture into the hole. Water the bottom of the hole as well as the plant in the pot prior to planting. Place the grapevine into the hole and fill in with remaining soil mixture. Water regularly during dry conditions, but do not allow the plants to become water-logged as this can lead to root rot. Fertilize the vines twice each year around the base (at least six inches out), do not allow fertilizer to get too close or it may burn the plant. Water the area to release the fertilizer. Plants will begin to grow in the spring, if planted in the fall. If you are planting in the spring, you will see some growth, but most likely will not have grapes for another year or two. This year you want to begin training the vines where to grow. This is accomplished by tying them to the trellis or posts in the direction they should grow. When fruit begins to grow, add plastic mesh over the plants to prevent birds from eating them. Pruning your grapevines is the most important part of this ‘art.’ Pruning allows you to manage the plant, regulate the size of the crop and adjust the quality of the fruit.